Elephant Butte State Park’s hiking trails and paths, including Luchini Trail, the Dirt Dam, and the 12-mile-long West Lakeshore Trail, are a great introduction to wild New Mexico — from paved road to primitive paths, folks of every capability can get out and enjoy the terrain. Paseo del Rio / Fish Hatchery Park campground, located between Truth or Consequences and Elephant Butte Dam on East Third / Highway 51, contains an easy but scenic loop that is used by walkers, campers, and the like. Paseo del Rio was renamed “Fish Hatchery Park” in 2017 — though it’s considered to be part of the Dam Site Historic District, it is actually located 1.8 miles west. It is still marked as “Paseo del Rio” on many maps and websites. Outside the state parks and municipalities, guide services offer guided hikes and photography expeditions. The Black Range, on the Eastern edge of the Gila Wilderness, is best viewed from Emory Pass on Route 152, west of Kingston. This spot is a trailhead for some great treks, ranging from five miles to nearly twenty-eight miles, and affords seasoned hikers some spectacular views. In October of 2010, two new educational trails – Yost Escarpment (1.5 miles) and Point of Rocks (1/2 mile loop) – were introduced by the National Parks Service along sections of the El Camino Real de Tierra Adentro National Historic Trail, which extends for 404 miles across parts of Texas and New Mexico. 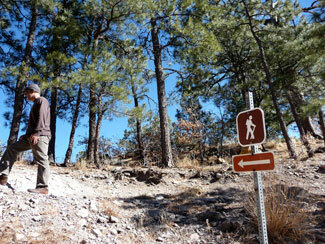 This article from National Parks Traveler provides information on the trails and their dedication. The newly-developed Healing Waters Trail in Truth or Consequences offers walkers a chance to get close to history. The downtown section is indicated by trail markers embedded in the sidewalks—visit an ancient gathering site of native peoples, and tour hot springs that have soothed visitors for decades. The Veterans Hill segment, set with informational markers and shaded benches, affords sightseers some great views of the Rio Grande and downtown areas. The trail head is well-marked right on Broadway; look for it at the west end of Veterans Memorial Park, a place for quiet contemplation (at least until Veterans’ Day, when folks come from miles around to take part in activities and ceremonies that honor those who served). A popular hike (that we’ve not promoted in the past mainly because it traverses private property) is Turtle Mountain (so-named because it really does look like a turtle). The peak is marked on maps as the Caballo Cone and is known to locals as Turtleback Mountain. Until recently, a shareable trail map was not available, but someone recently created a Google map to assist those who are looking for the Turtleback Mountain hike trailhead. Please note, this one is not for amateurs and should not be attempted alone. The trail is steep from the get-go, and rocky in places, so good hiking shoes or boots are absolutely essential. The physically fit can complete the round trip in around 3 hours; slower humans should allot 4-5 hours. Carry enough water and snacks to get you through. Access the Google Map by clicking the graphic below.